Water is said to be life. This is because everyone needs safe water for drinking, cooking, and simply for keeping him or herself clean on a daily basis. It is for this reason that the United Nations considers access to clean water a basic human right. Nonetheless, it is estimated that about 1.1 billion people do not have access to safe drinking water in the developing world, a situation that is resulting in approximately 1.8 million deaths each year from diarrhoeal diseases like cholera. The saddest aspect of this is that most of these deaths, about 90%, occur in children under five years. The good news is that household water treatment and safe storage interventions can lead to dramatic improvement in drinking water quality and consequently reduce diarrhoeal diseases. This, according to the World Health Organisation (WHO), can lead to a reduction of diarrhoea episodes by between 35% and 39%. 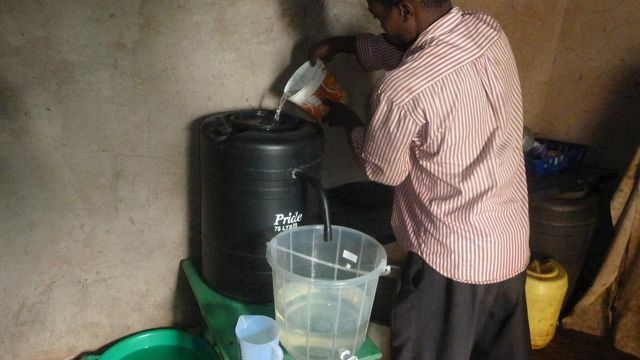 Indeed, there are many available treatment options for household water including biosand filters. A biosand filter consists of a concrete or a plastic container, filled with specially selected and prepared sand and gravel to help in removing unwanted substances from water. Biosand filters are perhaps one of the most promising low-cost technologies for point-of-use water treatment. For its potential to be fully realised, it must be culturally acceptable and available for rural folks on a sustainable basis. It is in line with this that the United Nations University Institute for Natural Resources in Africa (UNU-INRA) supported a study that evaluated the acceptability of the biosand filter in rural communities in Ghana and assessed its potential for eco-business development. The findings revealed that, out of 150 rural households sampled, nearly half of the respondents lacked access to improved water supply. Similarly, majority of the respondents (82%) did not apply any form of treatment to their drinking water. Interestingly, cultural reasons, cost and difficulty of treatment emerged as the main reasons that discouraged point-of-use water treatment. These findings call for education especially in rural communities, to promote the use of water treatment technologies like the biosand filter in rural households, particularly in developing continents like Africa. Another interesting dimension of the study is the business potential of the biosand filter. The research also assessed the competitiveness of the biosand filter as a local green business venture, by comparing it to sachet water production, which is usually considered as an alternative to household usage of the biosand filter. It was established that the biosand filter was more environmental friendly, provided quite comparable profitability and was potentially viable for eco-business development. This particular finding underscores the importance of investment in biosand filter production.